Who Is Mystery Bank Robber With Reddish-Brown Beard Wearing Gray Gloves? 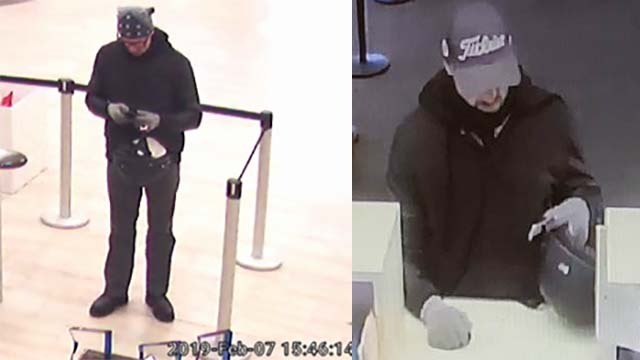 Investigators asked for help Friday in identifying a gloved bandit sought for robbing two San Diego credit unions. The first robbery occurred Jan. 29 at the California Coast Credit Union at 4265 Genesee Ave. The second occurred Feb. 7 at the San Diego County Credit Union at 11965 Bernardo Plaza Drive. 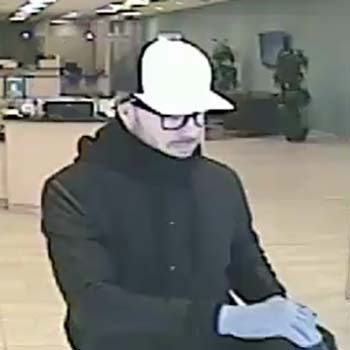 Surveillance footage from both banks show a man carrying a motorcycle helmet and wearing gray gloves, a black sweatshirt, dark pants, glasses or sunglasses and a hat. In both robberies, the man handed the teller a note demanding money and left after being handed an undisclosed amount of cash. The suspect is described as a white man in his late 20s, 5 feet 6 inches tall and 130 pounds, with a patchy, reddish-brown beard. Anyone with information about his identity or whereabouts was asked to call the FBI’s San Diego office at (858) 320-1800 or San Diego Crime Stoppers at (888) 580-8477 to make an anonymous tip.